The nation’s most precious revolutionary relic went on its last and longest road trip when it paid a call to San Francisco and the Fair. In 1912, Pennsylvania governor John Tener suggested California children circulate a petition to bring the Liberty Bell to the Jewel City. This was a tried and true stratagem, as it had been used to bring the bell to the 1904 St. Louis fair. By late autumn of 1912, half a million schoolchildren had signed a scroll of paper two miles long, which was rolled onto a huge reel. The petition was paraded down Market Street on Thanksgiving Day before it was sent off to the Keystone State. Prior to the PPIE, the Liberty Bell had been downright peripatetic. The bell had visited New Orleans in 1885, Chicago in 1893, Atlanta in 1895, Charleston in 1902, and Boston in 1903. When it was requested for the 1909 Alaska Yukon-Pacific Exposition in Seattle, it was found that a second crack was developing, extending up from the famous early repair. The bell stayed home, and a new, padded support was designed to relieve the pressure of its own weight. As 1915 approached, many Philadelphians vigorously protested the Liberty Bell’s removal because of its fragility. “Should it again be sent on a railroad journey across the continent, it is by no means unlikely that it would arrive there in two pieces,” pronounced expert metallurgist Alexander Outerbridge after examining the bell in early 1915. However, the opponents were overruled after sustained lobbying by former President Taft, Secretary of the Interior Franklin K. Lane, publisher William Randolph Hearst, San Francisco banker Herbert Fleishhacker, Philadelphia mayor Rudolph Blankenburg, and others. On April 15, the Select and Common Councils in Philadelphia voted to send the bell to the Exposition. To prepare for the trip, its clapper was removed and a steel skeleton installed inside the bell. After a reverent sendoff from Philadelphia on July 5, the bell began a whistle-stop tour across the country on an open gondola car cushioned by special shock absorbers and enclosed by an iron railing. At night, the brightly illuminated bell was visible from a mile away as it moved at a sedate pace through the darkened countryside. In daylight, veterans of the Civil War donned their military caps and stood at the doors of their homes waving flags at the passing train. The bell made more than seventy stops along its 3,000-mile route to San Francisco and, rain or shine, it was greeted by patriotic crowds. In some cities, special platforms were constructed so that children could walk across a ramp, file past the bell, and touch or kiss it. The train bearing the bell finally chugged into San Francisco’s Townsend Street Station after midnight on July 17. A boisterous throng had stayed awake to cheer its arrival. Finally the Liberty Bell was wheeled to the state section, gently plucked from its car by a crane, and transferred onto a solid, wheeled cart at the Pennsylvania Building. For four months it spent each day on view under the central loggia, but every evening it was rolled into a vault. Finally, on November 11, the bell was prepared for travel once more. It left the Exposition accompanied by cheers and church bells, and by tearful smiles of farewell. 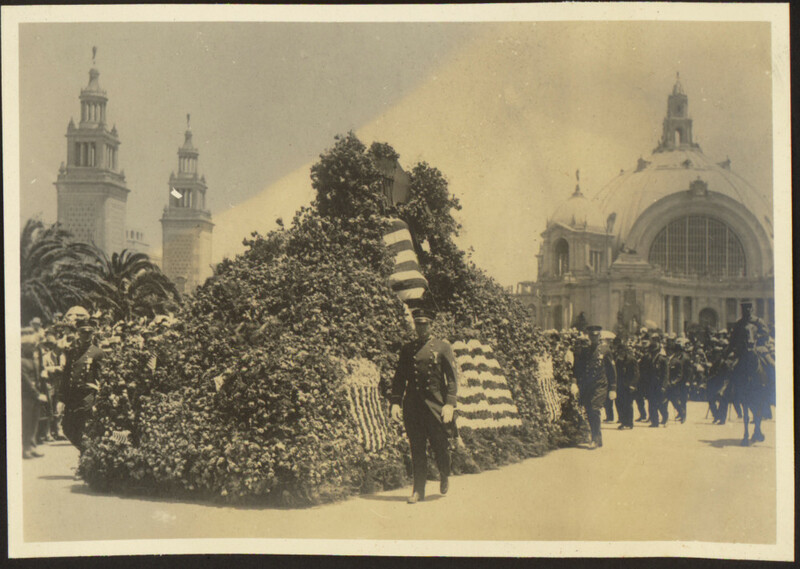 Share your own stories of the Panama-Pacific International Exposition online with Historypin at Mapping San Francisco’s 1915 World’s Fair.